When running my home and caring for kids I know I need some time management books to help me out. Here are my recommendations and reviews, and you can also share your own. There always seems to be more to do in the day than can get done, especially when running a home and caring for kids. That is why your time management skills are so important as part of being an effective household manager. 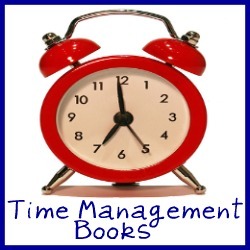 There are many books out there giving you tips and suggestions for managing your time. One I've previously reviewed is The Myth Of Multitasking, which discusses how multitasking actually doesn't help you get more done, but less. This is really meant as a business book, but I believe it has application to our lives and roles as home managers too. I have read quite a few more books about time management, and will be reviewing them over time. I would also like to hear from you though, to give me more suggestions and reviews of books that have helped you, and that you think would also help others. Please share your reviews with me below. Have you read a book about time management, scheduling your time and activities, or anything similar and thought it was really helpful or informative for you in your role as a home manager, and would recommend that others read it too?